"Playa Esmeralda Beach Resort all-inclusive hotel, Juan Dolio, Santo Domingo, Boca Chica, Dominican Republic"
Playa Esmeralda all inclusive hotel is located 12 miles freeway from Boca Chica on the wonderful beach of Guayacanes, on the southern coast of the Dominican Republic. Italian management. A small heavenly corner, 33 miles from Santo Domingo, 20 miles from Las Americas Airport and just 12 miles freeway from Boca Chica Beach, full of nightlife, on-the-sea-restaurants, discos and Casino. The location is perfect for transfers trips and golf . In less than one hour you can reach all the most interesting tourist resorts. Cars and motor-bicycles can be rent directly at the hotel. 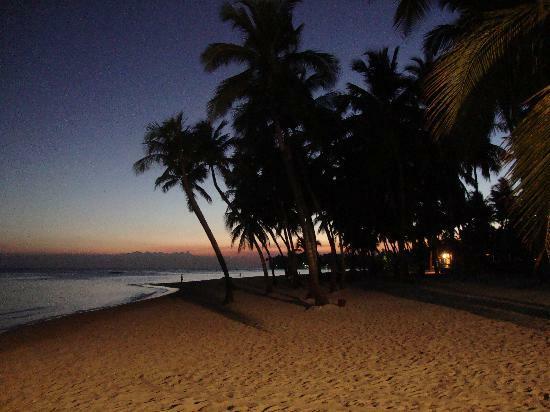 The private white-sands beach is sheltered from the barrier reef, in an uncontaminated coconut palms-fringed nature. The sea is a dream-like view 30 meters far from your breakfast table. Playa Esmeralda oceanfront Hotel is on the seaside, with its colonial-style buildings, cane roofs and lava-stone facings, perfectly blend with the luxuriant tropical garden. The hotel has 44 rooms (Italian furniture) spread in 5 buildings, almost all viewing the sea. All rooms are finely fitted as follows: 1 double-bed or 2 twin-beds or 1 double-bed and 2 twin-beds, A/C, Ceiling fan, terrace, Bathroom with shower, international cable TV, telephone, in-room safe, refrigerator. Free internet wifi connection from the rooms and from the bar / pool area. Swimming-pool, Bar, Restaurant, Diving school, Table-tennis, Windsurf, Kayaks, Beach bowling, Beach volley, Water gym, Bicycles, 2 miles from 18 holes golf courses, Casino (Juan Dolio) and Horse riding, Free parking, Laundry, Cars and motor-bicycles hire, Exchange counter, Trips counter, Medical assistance, Entertainments, Boutique, Video - Room. BAR AND RESTAURANT "ALL INCLUSIVE"
From10.00 a.m. until 11.00 p.m. all alcoholic and nonalcoholic domestic and international drinks are served non-stop at the bar, as well as exquisite tropical cocktails. The italian, dominican and international cuisine at the buffet restaurant is high quality. Special courses on request can be prepared directly from the chef. Bread and pastries are daily cooked by the pastry-cook.
" FOOD: 3 meals a day, and they are plentiful and delicious. If you are somebody who needs snacks in between meals, (most Americans), then you may have to make a run to one of the local stores in the small fishing village. The hotel is impecably run by Italians, so it is only fitting that pasta is a central element of the meals. Every night features an outstanding pasta bar, with the type of pasta rotating every night (eg. spaghetti, linguine, penne etc.) That is in addition to the daily hot food buffet they serve which usually features pork, chicken or beef, potatoes, vegatable, soup, salad and deserts. I am an American with Italian heritage, so I typically stick to and enjoy the excellent pasta bar. The first time I went to the DR, I was deathly afraid of becoming sick from the food, but I have the utmost trust in the food prep and quality at Esmeralda. Out of the voluminous meals I have eaten there, I have NEVER been sick. EXTRAS: Make sure you get out to the road, catch a bus and journey to one of the local towns. It is an unforgettable experience. The locals are the friendliest people i have ever met. Don't let anybody tell you that it is not safe, because that is so untrue...."